Your washer bottle cap isn't snapped in man, be careful!! Love the way the engine bay has changed, every FD needs new wiper and coolant tanks at this stage of the game IMO. Brakes should go on today. Hope to post some before and after shots. Have some errands to run but right back at it this afternoon. 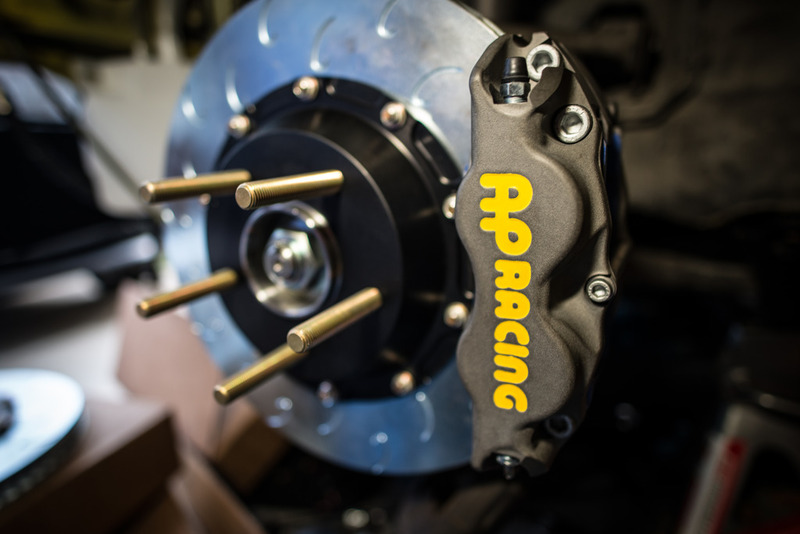 SakeBomb AP Racing BBK with additional Zinc Coating on Rotors. Looking really nice very clean and well done. 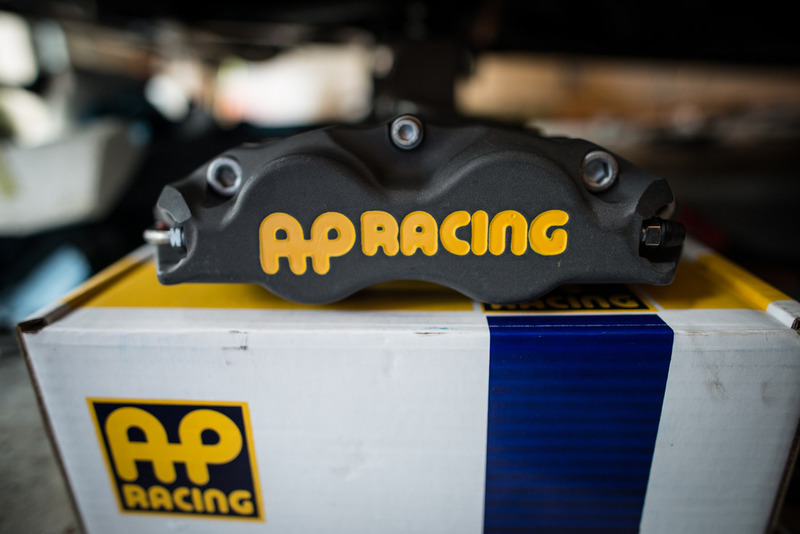 about the AP racing BBK: are you upgrading the rears as well? as much as i love to see new expensive BBKs for the front, i would hate to install them and throw the brake balance way-too-much front and render the rear brakes useless. i see they do mention that in the description for this kit on their site. i also wonder about the fluid volume of those calipers vs the stock calipers, does anyone know how much more/less fluid their circulate than the stock calipers? i also wonder how the ABS deals with the much more effective front braking. 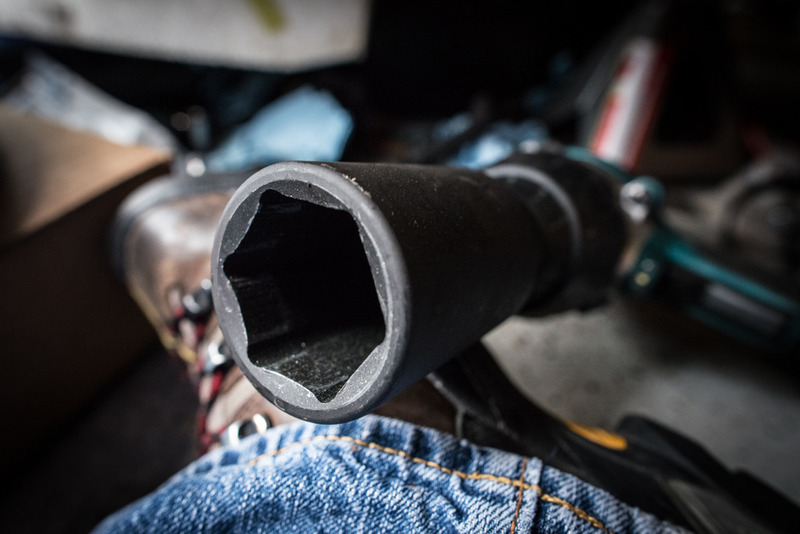 if you're curious, here's an interesting article from Centric (they own the Stoptech brand) about brake bias with BBKs. 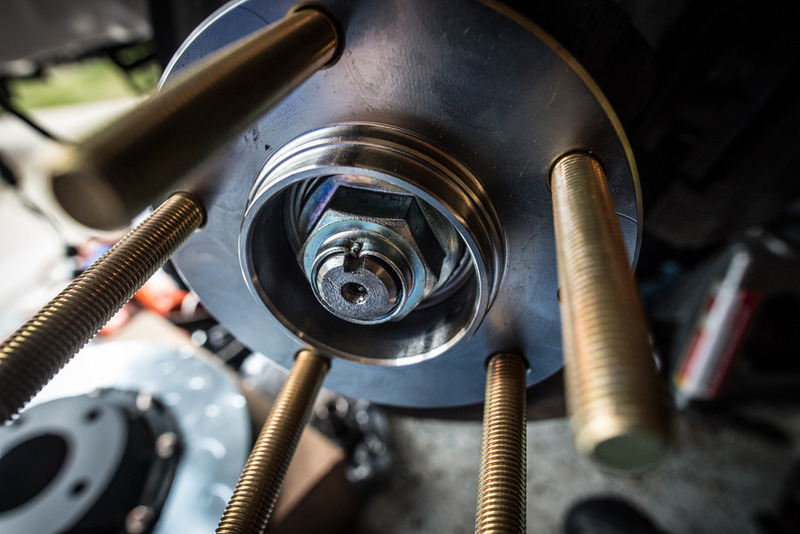 ^i was a product manager for brake hydraulics in a former life, so i became obsessed with this type of stuff. Yes the rear kit was also purchased. 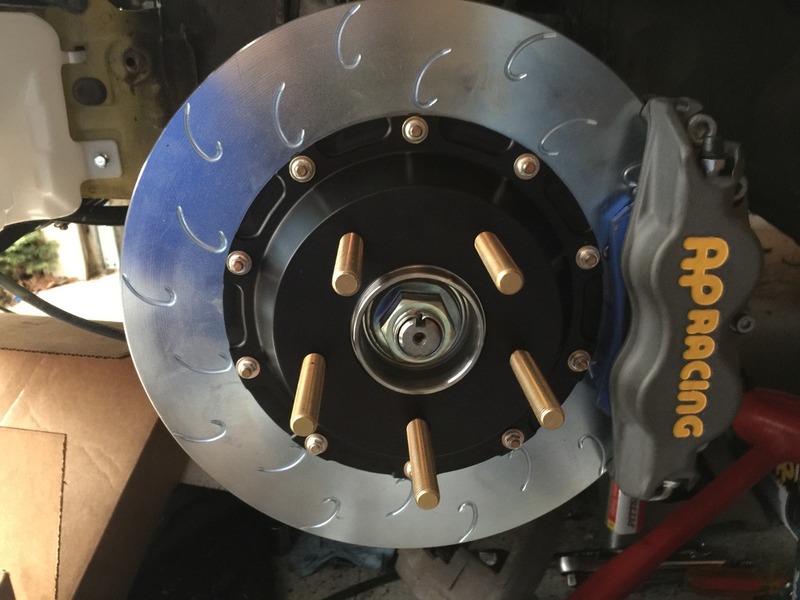 They are also J hook rotors to match and are 99 spec sized. 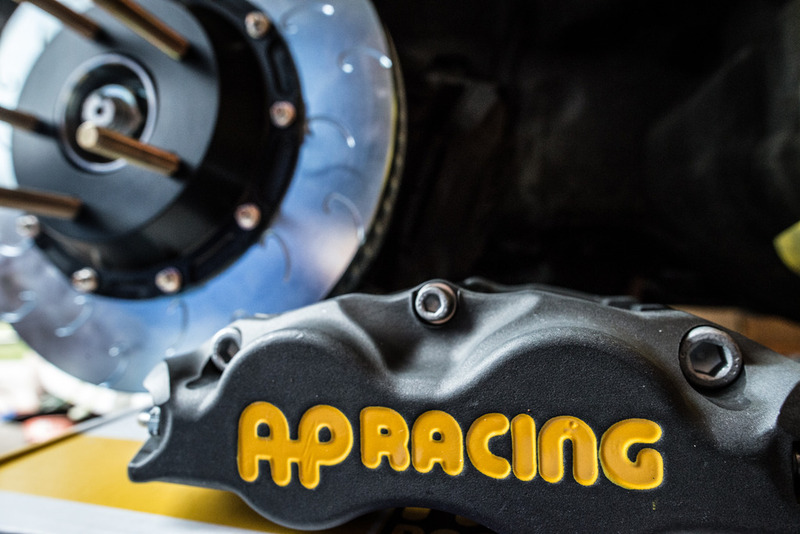 There are adapter brackets and use the rear caliper and the E brake is retained. Also there will be a Brake Bias Asjuster so the bias can be adjusted so there won't be too much front bias. J-Auto overnight shipped the Hubs with ARP 3.25" extended studs. I talked to Juan from J-Auto and he didn't have the studs in stock. He hustled and got them, pressed them into the hubs and overnighted the box Fedex morning delivery. It cost me over $100 for the shipping but I got them and he made it happen on very short notice. I will be buying everything he sells for the FD now. Also got the new Axle nuts. Once you put the axle nut on to 170-210 ft lbs or there abouts... use a punch on the axle nut to help keep it from backing out. Or a screw driver. As seen here. Another Mazda in the driveway. Picked it up last year. Wife drives it mostly. 2016 Mazda 3S Touring. Man. I take a nap, and you wrap up the front brakes. Feeling lazy. I was going to save doing the rears until I got the new rear bearings, extended studs, chromoly axle shafts etc. decisions, decisions. I quit counting after $32k in parts. That doesn't even include the cost of the car or my friends and I labor on it. When this is all said and done this build will be at or near $60k Car and parts alone. It's amazing it all added up so quickly, this was without pulling any of the drivetrain or replacing the turbo kit. Even though the RX-7 isn't as expensive of a platform as a 911 or GT-R; you can still spend some serious money. Especially if you were paying for a shops labor. I wouldn't be surprised if some of the builds on here are near 6 figures. Easily the nice 3 rotor builds but even the 2 rotor builds like Phil Sohn's. Possibly also Farkels LS3 swap. Those are incredibly nice big dollar builds. I wouldn't have gone this far if not for the bad influence of GoodfellaFD3S, FourtyOunce and 1CLEANCYM. Thier nice cars forced me to do this. Also Heath at SakeBomb Garage. He hooked me up with a lot of the expensive stuff. He is a busy guy but always replied to my inquiries and got me my parts. Agreed. It's always great to get good help and do things yourself. Can't wait to see this thing on the road. For those who have a BBK you know there is more of a likelihood of brake squeal with these kits. Pad choice but also other factors like free floating disc etc can allow some additional harmonics to start making music. I've had this brake kit previously on another FD and it would sometimes make noise but mostly it was quiet. I used the typical solutions when installing the last kit. 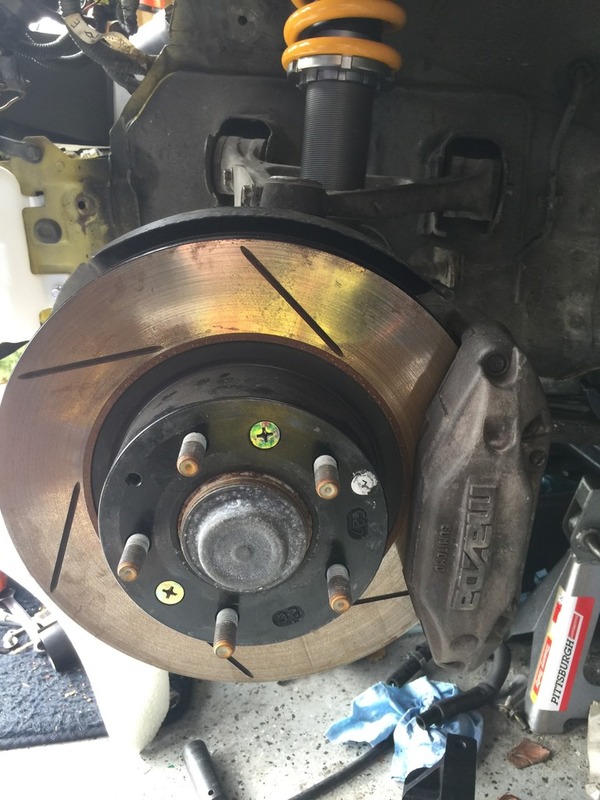 I used small packets of brake grease behind the brake pad but it still made noise on occasion. Friends of mine with this kit had more noise and tried several solutions without much relief. 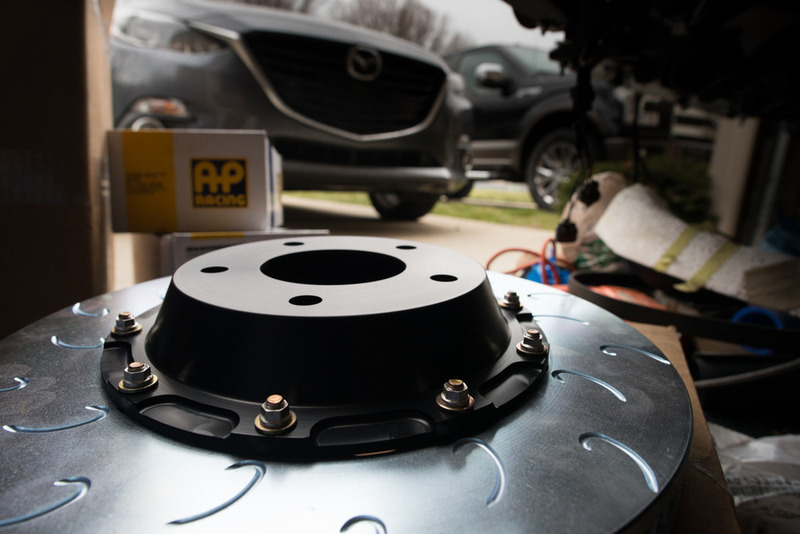 After talking to another long time owner of this kit who tracks his car regularly; he said he was able to remedy all the brake squeal by using the stock multi-piece brake shims with the AP Racing track brake kit. So I have decided to do the same thing before hitting the road and bedding these in. I haven't yet Hooked up the brake lines to bleed them so now is the ideal time to pull the pads back out and install the stock shims. You don't need to buy a stock set of pads just to get the shims. You can buy the shims as just a hardware kit. 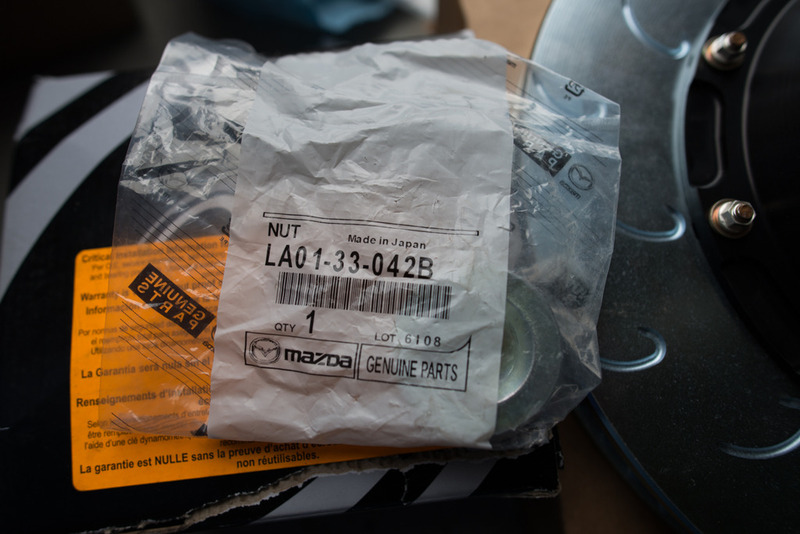 Here is the part number for the factory Mazda front hardware brake pad shim kit. If you have OEM pads or buy OEM front pads; they automatically come with this hardware kit. Kit goes for about $40. Momma always said be careful with who you associate with. DSS 300M Axle shafts, new Koyo rear wheel bearings, ARP 3.25" extended studs, Greddy Aluminum Diff cover, SakeBomb Passenger foot rest and a bunch of other misc stuff in the mail and should have by end of week. 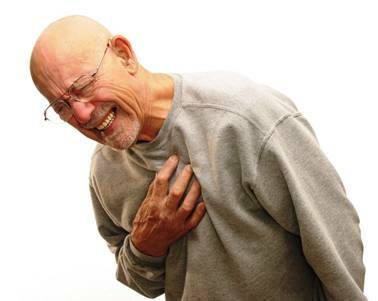 I had to take off the CV boot anyway and one of them has a cut in it. May as well upgrade the Axle shafts while I'm in there. Don't forget the dust cap for the front hub. I heard that too; and dirty. 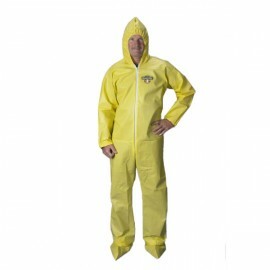 I may get a Tyvec suit so I'm not covered in grease. Titanium Hardware didn't break the budget too bad. Such a nice day today. I'm watching the clock so I can rush home and work on the FD. I'm watching the clock so I can rush home and work on the FD. I know the feeling. It's sunny and 72 in Nashville right now. Let's chat cars to help pass the time. you should bring the car down to DGRR on April 26th through April 30th. You could caravan down with IRP. It really is and after starting to buy the stock hardware in bulk I realized it's just cheap Zinc coated mind steel and will be oxidizing, then rusting again in a few years. Replacing it with stainless is ok for some things but stainless is weaker than mild steel so don't use it on any load bearing parts. 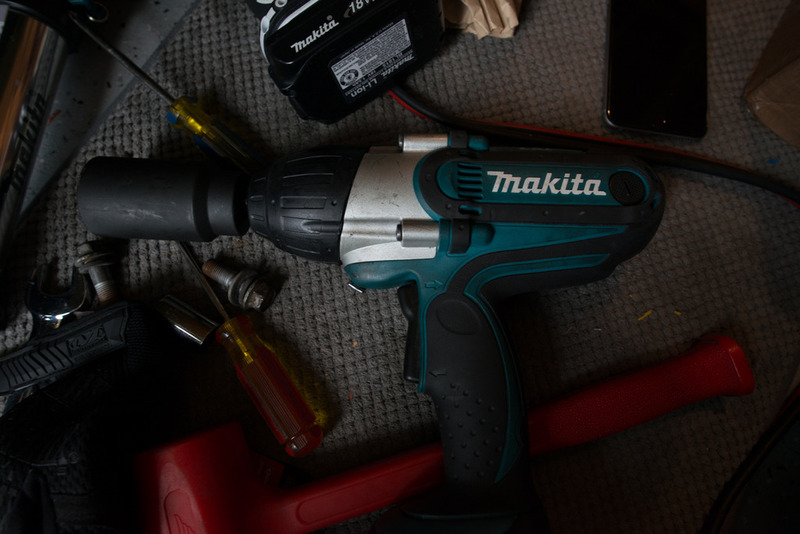 Titanium onnthe other hand won't rust and is lighter and twice as strong as the original hardware... and basically close in price to the Mazda junk. I try not to drive the FD outside of my AAA Plus towing range lol. But if I had a hauler I would consider it and just drive the car while I was there. Maybe next year when GoodfellaFD3S can make it up from Florida and meet up at DDGR. Will have to see what life has to offer next year at this time before I can commit.